Wow, this sounds like such an engaging and clever novel. I like how you describe how Marias gets the levels of complex psychology involved in relationships. I’ve wanted to read his novels for a while and can’t belive I haven’t got around to them yet. You’ve done an excellent job at capturing the major themes of the novel and conveying how much you respond to his writing. 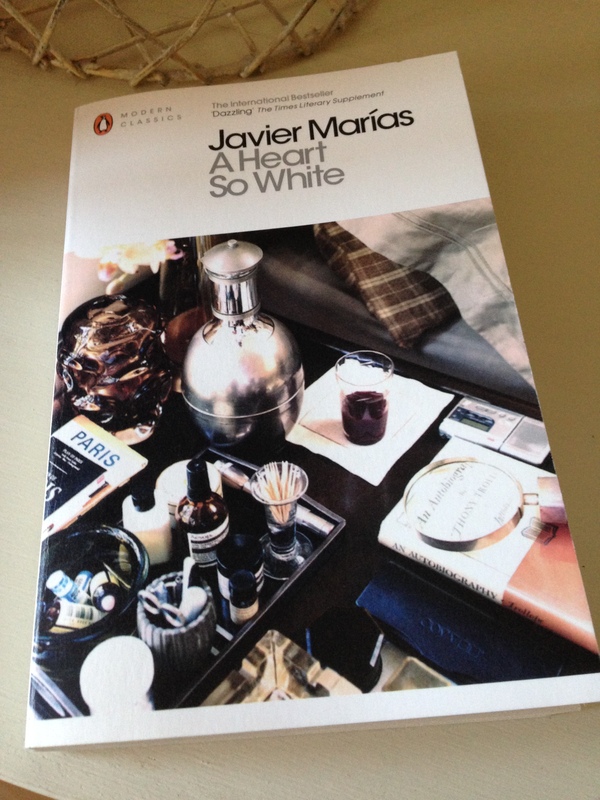 Do you think this is a good Marias novel to start with if you haven’t read anything else by him or is there another one that would be better to read first? It is a very clever and thought-provoking novel, beautifully constructed too. I’m still fairly new to Marias myself (as I only started reading him a couple of years ago). I probably haven’t read enough of his work to advise on the best place to start, but other commenters may well have some thoughts on this. That said, A Heart So White does seem to capture several of this author’s favourite themes: secrets, truth, how well we know those closest to us, mortality, the mysteries of life. If you’re thinking of reading one Marias novel to get a sense of his style (and to see if he’s a writer for you) then Heart would certainly fit the bill. It’s a much-loved novel and unlike his Your Face Tomorrow trilogy its a standalone work. I think you’d like him, Eric! Thanks! I hope to get to it soon. It was partly the thought of the trilogy which has kept me back I think – difficult to invest in reading a trilogy when you don’t know if you’ll really like the author so this novel would be a good place to begin. I think I first came across him when I heard Ali Smith raving about his writing – an opinion I always trust. Your considered review only reinforces my feeling I’ll take to his writing. You’re very welcome, Eric. I’m glad Helen chipped in with another suggestion for you. I agree, it’s a tall order to commit to a trilogy if you’ve never read an author before. I didn’t know Ali Smith was a Marias fan. Well, she’s clearly got great taste in writers (not to mention frescoes!). I hope you enjoy Marias – do let us know how you get on. Great review Jacqui as this is not an easy book to write about …..it is , however, my very favourite Marias …it has so much to offer . Thanks, Helen! I had a feeling Heart was your favourite. Yes, there’s so much to this book, and it certainly rewards rereading. I have three unread Marias novels on my shelves: All Souls, The Man of Feeling and Tomorrow in the Battle… Have you read any of these? I thought I might try All Souls next as it sounds a little different to the others. Also, do you have any thoughts on Eric’s question on a good place to start with Marias. I probably haven’t read enough, but my sense is that Heart would make a good entry point. What do you think? You might be able to suggest a better one? I have read Tomorrow In The Battle …that was the first Marias I ever read and I think that it heart are the best place to start . Battle is prob more ‘free standing ‘ than the other ones where a lot of characters appear and reappear . Never read All Souls ….looks amazing so I will await you review in due course . I have read the Your Face Tomorrow trilogy ….quite an undertaking but hugely rewarding . That’s great – many thanks, Helen. I’m thinking of reading All Souls later this year, maybe in the summer if Richard and Stu hold another Spanish Lit Month. Great, Helen. I’ll start with either “Tomorrow” or “A Heart so White” Thank you. Thanks, erdeaka. It is a brilliant book – very clever and thought-provoking too. I can’t recommend it highly enough. I’m so glad to read this. I just love this book and re-read it every couple of years. I don’t know why it is, but one of the things that stays with me most is the episode when he hears the woman in the next room in the hotel singing, “Mother in law, she lyin, yen yen yen”. What do you make of that? Oh, that’s nice to hear! There’s so much this book, all those themes and layers; it certainly rewards rereading. Deep themes involving relationships, social structures, and psychology sound like my cup of tea. The writing and humor sound really good too. I think that rereading is an important thing to do. I wish that I had more time to do it. It’s great, Brian. There’s so much to think about here. The quotes should give you a good feel for Marias’s prose style. He writes such beautiful long, immersive sentences…as a reader, you just want to sink into his novels. He uses humour to very good effect here. I didn’t notice it so much in The Infatuations, but it’s there in Heart. I’m with you on rereading – I wish I had more time to do it too! It’s an excellent novel. I can thoroughly recommend it. Golly, I’ve never even heard of this novel yet you make it sound so mouthwatering! I must put it on the (alas, near-infinitely long) list. Many thanks! I’ve owned this for years but never get over that first stunning paragraph. Not sure why. I know I would love it. I didn’t think your review was disjointed but sometimes when we like a book a lot we always feel the review falls short. Thanks, Caroline. I think you’re right. It’s often the way with books we love; we want to do them justice. That first paragraph is brilliant, isn’t it? It must be one of the best openings I’ve come across. You’ll have to go back to it at some stage as I’m sure you’d love it! I think you’d enjoy Marias’s writing. Jacqui this is certainly a book that I would like to re-read it again, since it was quite a long time ago that I read it for the first time. Oh, that’s great, Jose. It certainly rewards rereading as there’s so much to enjoy. I read this last year for the first time – though rather than a dark winter I read it in the summer sun on a beach in Barcelona. And I loved it! The writing has a depth and seductiveness exactly as you described. Even though I’d loved it I. had no idea how to review it – think you’ve captured it perfectly! That’s very kind of you to say, Col. Well, I did have the benefit of reading it twice before gathering my thoughts together! I’m so glad you enjoyed Heart, too. A beach in Barcelona sounds like the perfect setting (or perhaps a bar in Madrid). I think Marias has the potential to become one of my favourite writers; I just want to read everything he has written. I have found the Marías novels I’ve read so far fascinating – especially the Your Face Tomorrow trilogy. This one is so high on my list, and your review so encouraging, that I think I’ll read it next. Fantastic. I thought you might be a Marias fan (in fact, I had a quick look at your blog before I posted this piece to check if you had reviewed Heart). It’s the combination of his themes and beguiling prose style that fascinates me; I just find his books completely immersive. I wonder how this one will compare with the Your Face Tomorrow trilogy? I’ll be very interested to hear what you think of it. I haven’t read Marias yet at all and feel like I’m missing out hugely. It sounds like the sort of writer and book to interest me. Also like your choice of The Great Gatsby to reread, though – that’s a perennial favourite of mine, along with Jane Austen’s Persuasion (which I can always reread). Marina, I can only encourage you to give Marias a try! I think you have to give yourself over his books as they’re quite immersive but very rewarding. I love the way he writes; I just want to sink into his prose. His themes are interesting too, all the big subjects in life, and I like the way he uses mystery and uncertainty within his stories. A Heart So White would be a good one to try as it seems to capture many of Marias’s favourite themes…it would give you an excellent feel for his style. Alternatively, Helen has suggested Tomorrow in the Battle Think on Me as another possible entry point. I forgot to say…Gatsby’s great, isn’t it? I don’t think I’ll ever tire of reading that book. It’s been several years since I read Persuasion so I’ll have to put it on the reread list! I want to reread ‘Tender Is the Night’ soon, as it’s been years since I read it and loved it, and I think I’d have a different take on it at my age now. Thanks, Seamus. I enjoyed The Infatuations very much; it contains some beautiful writing on grief, passages that really resonate with me. Heart is even better, a more complete novel in some ways. The Your Face Tomorrow trilogy is on my wishlist too, but I ought to read at least one of the three unread Marias novels I already own before buying any more! Right, I’m off to read your All Souls review now – many thanks for the link. I think it’ll be my next Marias. Belated thanks for the link, Jacqui, and for sharing your enthusiasm for Marías. Such a satisfyingly intelligent and humorous writer. And I love your comment about the seductive quality of those “immersive sentences” of his. Spot on. The Your Face Tomorrow trilogy is probably my favorite Marías of them all, and I actually prefer Tomorrow in the Battle Think on Me to A Heart So White if truth be told. Both used to be thought of as the best one-volume Marías novels before The Infatuations, which was also warmly received, but the slightly more humorous All Souls is also pretty great and what people like Rise and Tom have said about the anti-novel Dark Back of Time make me realize what an idiot I am for having started it but never finished it due to my perennial short attention span. I’m ready to go for another Spanish Lit Month this summer; those of you who also want another one will just have to keep the pressure on Stu to make sure he wants to do it again (it’s his baby, after all). Cheers! You’re very welcome, Richard – not belated at all! Many thanks for your comments. I feel as though I may have found my desert island writer (or one of them at least). I’m delighted to hear that you prefer Tomorrow in the Battle to A Heart So White. It’s nice to know I have a great book to look forward to – perhaps I’ll save it for a while. The Your Face Tomorrow trilogy is sounding increasingly like a must buy, I’ve heard nothing but praise for it. I’m curious about All Souls as it sounds a little different to Heart and The Infatuations. Well, I’m all set for another Spanish Lit Month too so we’ll have to encourage Stu to set it up…and it’ll give you an opportunity to return to Dark Back of Time! I thought you review was excellent, Jacqui – a great introduction to Marias. I think this was the first of his novels I read and I’ve also read it twice. He’s one of those writers where I’ve gone on to read everything else available in English! I’ve also quoted that opening as one of the best ever! Many thanks, Grant. I’m tempted to follow in your footsteps as I just want to read them all! Did you review Heart? I looked at your blog on Tuesday morning but couldn’t see it. Let me know if you have, and I’ll add a link to yours. That opening is pretty stunning, isn’t it? I wondered if you ever use it in your teaching. I read this a couple of years ago and you have reminded me that I haven’t read anything quite like it since! I particularly liked the observations about translation and interpreting. His style is very distinctive! The observations about translating and interpreting are very amusing, aren’t they? I liked the way he captured the rivalry between translators and interpreters, the sense of disdain they have for one another. I might try All Souls as my next Marias – it sounds as if it contains more on the theme of translation/mistranslation. Great review Jacqui, and oh, what an opening! Talk about grabbing the reader by the throat. Another writer I must try one day. Thanks, Lindsay. It’s a great opening, isn’t it? The image of Teresa aiming the gun at her is powerful enough on its own, but the mention of her recent return from honeymoon raises questions about the marriage. And then there’s the way Juan opens the sentence: ‘I did not want to know but I have since come to know…’ It just adds to the intrigue. This sounds good Jacqui which is just as well as I own a copy. I have yet to try Marais though, so it’s good to know that he’s becoming a favourite. Books that are part mystery and philosophical can be very rewarding. Sorry for not replying earlier–for some reason I didn’t get notification. I was thinking it was weird that it was such a quiet week with NO ONE writing posts on the blogosphere. Annoying. Absolutely no need to apologise, Guy. Comments are always welcome anytime. The lack of notifications is frustrating though – I hope it’s all sorted now. Marias has quite a distinctive style so you’ll probably either love him or hate him. I like how he uses uncertainty in his stories as there’s usually something sinister or an element of deception involved. I think he’s interested in the following question: how well do we know those closest to us? Heart would make a good starting point, so it’s great to hear you have a copy. I think you’d enjoy the passages on translators and interpreters, they’re very funny. I wasn’t thrilled by the two Marias I’ve read but everyone says this one is great. I’ll read it someday. Thanks, Emma. It’s worth a look if you ever want to give Marias another try. I think you liked his prose style in Tomorrow in the Battle…. Thanks, Simon. I agree – I think Marias is a wonderful writer. His prose is sublime – I just want to lose myself in those long, looping sentences. I keep trying to encourage Max to give him a try. One day, I hope. Heading over to your blog to read your review of the Your Face Tomorrow trilogy, a series I really must read at some stage. Thanks for letting me know about your posts. Finally I get to re-read this thing after having read the novel and written up something about it! I wholly sympathize with your feeling “disjointed” in trying to get a handle on it. You touch on several aspects of the work I failed to address – Juan’s ambivalence about his marriage to Luisa, the humorous manner in which domestic and diplomatic secrets get juggled, the repetition of certain motifs that create these echoes and reverberations through the novel. Given the density of some of Marías’ lengthy digressions, I’m astounded to recognize all of those quotations; they’re tenacious. Thanks so much for providing here the impetus for me to tackle this as my next Marías. Ha! You’re very welcome, Scott. I’m just delighted to see such an insightful, thoughtful and eloquent review of Heart over at yours! I loved your commentary on the scene in which Juan overhears the conversation in the adjoining bedroom and how he behaves with Luisa during that evening. I didn’t even mention that entire section of the narrative, never mind the links to Macbeth. Isn’t it interesting how we’ve all seen something different in this book? The sign of an excellent and rich novel, don’t you think?